The last decade has witnessed significant advances in the development of biomarkers in oncology that play a critical role in the understanding of molecular and cellular mechanisms that drive tumor initiation, maintenance, and progression. Clinical molecular diagnostics and biomarker discoveries in oncology are advancing rapidly as investigators begin to understand the complex mechanisms that transform a normal cell into an abnormal one. These discoveries have fueled the development of novel drug targets and new treatment strategies. The standard of care for patients with advanced-stage cancers has shifted away from an empirical treatment strategy based on the clinical-pathological profile to one in which a biomarker-driven treatment algorithm based on the molecular profile of the tumor is used.1 Recent advances in multiplex genotyping technologies and high-throughput genomic profiling by next-generation sequencing (NGS) make possible the rapid and comprehensive analysis of the cancer genome of individual patients, even when derived from very little tumor biopsy material. Predictive biomarkers can be helpful in matching targeted therapies with patients and in preventing toxicity associated with standard systemic therapies. Prognostic biomarkers identify somatic germline mutations, changes in DNA methylation, and elevated levels of microRNA and circulating tumor cells in the blood.1 Predictive biomarkers using molecular diagnostics to evaluate benefits that can be achieved through targeted therapy are successfully being used in clinical practice of personalized therapy for the treatment of several cancers. However, a number of challenges are associated with incorporating biomarker testing in the management of patients with cancer, and guidance in “what works best” is of interest to many oncology practices, both at academic centers and in community practice settings. To this end, best practices for incorporating molecular biomarker testing in the delivery of precision therapy in lung cancer were the focus of a conversation between Roy S. Herbst, MD, PhD, Chief of Medical Oncology and Director of the Thoracic Oncology Research Program at the Yale Comprehensive Cancer Center, New Haven, CT, and David L. Rimm, MD, PhD, Professor, Department of Pathology, Director of Pathology Tissue Services, and Director of Translational Science in Pathology at the Yale University School of Medicine, New Haven, CT. These 2 experts shared their perspectives on how they work together as part of the cancer care team to deliver optimal personalized care to their patients. Many of their insights can be applied broadly to both academic- and community-based practices striving to meet the challenge of effectively incorporating biomarker testing into their treatment of patients with lung cancer. This initial exchange between the medical oncologist and the pathologist set the stage for a discussion on how the use of molecular biomarkers affects clinical practice, particularly as it applies to immunotherapy in lung cancer. 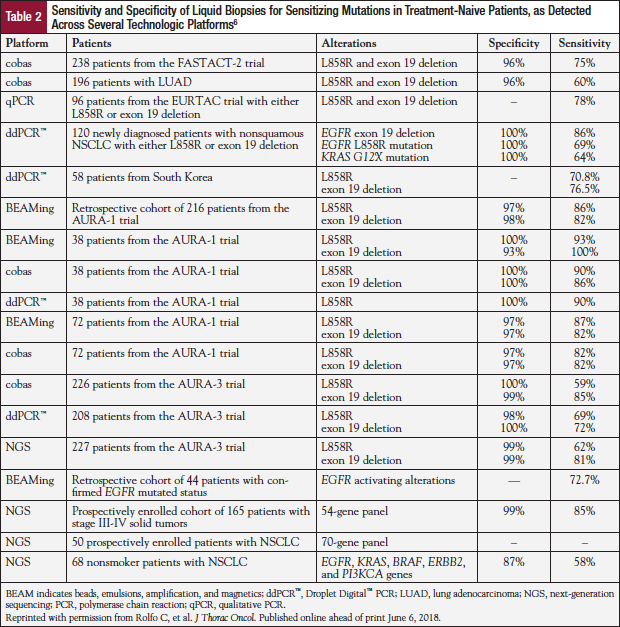 The experts’ comments reflect the fact that targeted therapies have changed the standard of care for stage III and IV non–small-cell lung cancer (NSCLC) from nonspecific cytotoxic chemotherapies to precision treatments in select patients based on the identification of predictive molecular biomarkers targetable by specific agents.2 However, there are still challenges to overcome in successfully implementing biomarker-driven targeted therapy in clinical practice.3 Clinically useful molecular biomarkers can be divided into gene fusions or gene amplifications (tested at the cellular level by immunohistochemistry or at the cytogenetic level by fluorescence in situ hybridization), and gene mutations (eg, EGFR mutations).2,4 Moreover, screenings that include RAS, BRAF, MET, ERBB2, ALK, ROS, and PD-L1 have been shown to be useful in treating patients with lung cancer, such that targeted NGS is now replacing single-gene testing methods (Table 1).2,4,5 These developments require the entire cancer care team to work together to ensure that appropriate tissue samples are collected and requests for biomarker testing are clear and grounded in evidence-based practice. Dr Herbst and Dr Rimm discussed the various ways that oncologists and pathologists can work together to optimize this process. Another major challenge in biomarker testing is acquisition of adequate and appropriate tumor tissue. The accuracy of molecular tests is affected by both the quality and the quantity of the tumor tissue obtained, placing great emphasis on the importance of collecting and processing the samples.3 Educating physicians who are performing biopsies about the importance of obtaining a sufficient amount of tumor tissue is critical in meeting this challenge. For example, molecular testing of lung adenocarcinoma is usually requested on small biopsy specimens obtained by either core needle biopsy (CNB) or fine-needle aspiration (FNA) biopsy. CNB yields a larger tissue specimen and provides a significantly higher number of samples sufficient for molecular testing than does FNA (in one study, 67% vs 46%, P =.007).8 Therefore, radiologists performing CT-guided lung biopsies should be encouraged to use CNB rather than FNA. This may be accomplished by using shared protocols or accessing existing guidelines. This framework can assist pharmacists, physicians, and policymakers in evaluating the implications of specific pharmacogenomic strategies. Nevertheless, each oncology practice must determine the current state of payer reimbursement for biomarker tests (including NGS). Which tests are authorized and covered more easily than others? Does ease of obtaining authorization and coverage vary by tumor type? Which payers (Medicare vs commercial vs managed care) are relatively more “generous” and straightforward than others? What steps are involved in preauthorizing biomarker testing? Each practice also needs to develop standard operating procedures for preauthorization and payer interface. It is vital for each practice to be aware of the steps their affiliated cancer center has taken to address biomarker-specific, payer-related challenges. Have oncology and pathology collaborated to develop a set of reflex tests and specific testing protocols? Does oncology or pathology order biomarker tests? Does the pathology administration educate pathologists and oncologists about payer access and reimbursement issues to streamline the process? Garinet S, Laurent-Puig P, Blons H, Oudart JB. Current and future molecular testing in NSCLC, what can we expect from new sequencing technologies? J Clin Med. 2018;7:E144. Lee DH. Practical issues of biomarker-assisted targeted therapy in precision medicine and immuno-oncology era. ESMO Open. 2018;3(suppl 1):e000370. Luk PP, Selinger CI, Mahar A, Cooper WA. Biomarkers for ALK and ROS1 in lung cancer: immunohistochemistry and fluorescent in situ hybridization. Arch Pathol Lab Med. 2018;142:922-928. Ahmadzada T, Kao S, Reid G, et al. An update on predictive biomarkers for treatment selection in non-small cell lung cancer. J Clin Med. 2018;7:E153. Rolfo C, Mack PC, Scagliotti GV, et al. Liquid biopsy for advanced non-small cell lung cancer (NSCLC): a statement paper from the IASLC [published online ahead of print June 6, 2018]. J Thorac Oncol. doi:10.1016/j.jtho.2018.05.030. Lopes G, Wu Y-L, Kudaba I, et al. Pembrolizumab (pembro) versus platinum-based chemotherapy (chemo) as first-line therapy for advanced/metastatic NSCLC with a PD-L1 tumor proportion score (TPS) ≥ 1%: open-label, phase 3 KEYNOTE-042 study. J Clin Oncol. 2018;36(suppl). Abstract LBA4. Schneider F, Smith MA, Lane MC, et al. Adequacy of core needle biopsy specimens and fine-needle aspirates for molecular testing of lung adenocarcinomas. Am J Clin Pathol. 2015;143:193-200.
van der Velden DL, van Herpen CM, van Laarhoven HW, et al. Molecular tumor boards: current practice and future needs. Ann Oncol. 2017;28:3070-3075. Cree IA, Deans Z, Ligtenberg MJ, et al. Guidance for laboratories performing molecular pathology for cancer patients. J Clin Pathol. 2014;67:923-931. Schwarzenbach H, Hoon DS, Pantel K. Cell-free nucleic acids as biomarkers in cancer patients. Nat Rev Cancer. 2011;11:426-437. Crowley E, Di Nicolantonio F, Loupakis F, Bardelli A. Liquid biopsy: monitoring cancer-genetics in the blood. Nat Rev Clin Oncol. 2013;10:472-484. Ettinger DS, Wood DE, Aisner DL, et al. Non–small cell lung cancer, version 5.2017, NCCN Clinical Practice Guidelines in Oncology. J Natl Compr Canc Netw. 2017;15:504-535. Pirker R. Molecular biomarkers in advanced non–small-cell lung cancer: a rapidly changing field. J Oncol Pract. 2017;13:231-232. Flowers CR, Veenstra D. The role of cost-effectiveness analysis in the era of pharmacogenomics. Pharmacoeconomics. 2004;22:481-493. Flowers CR, Veenstra D. Will pharmacogenomics in oncology be cost-effective? Oncol Econ. 2000;1:26-33.